You have the world on top of the mountain with this beautiful desktop piece. This glass world globe with frosted countries are highlighted when the colors change slowly from red to blue to green and colors in between. 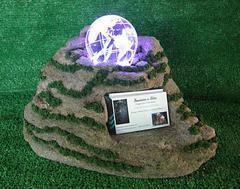 The globe sits on top of the hand carved real lava rock as the light shows up from underneath the globe. Accenting the lava rock is artifical greenery and on the bottom we have felt tip pads to protect your furniture. Show off your business cards in the carved out section. No one will miss this beautiful display. Displays take anywhere from 2-3 days to complete.